At a ham 2012 fest in Perth in I purchased a compact easily deployable portable HF antenna less the crucially important balun. While I have not been able to locate any information about the particular antenna purchased there are a number of similar products presented on the internet as HF Tactical Broadband Antenna and the like. Photo 1 Fast deployable HF Tactical Broadband Antenna kit. 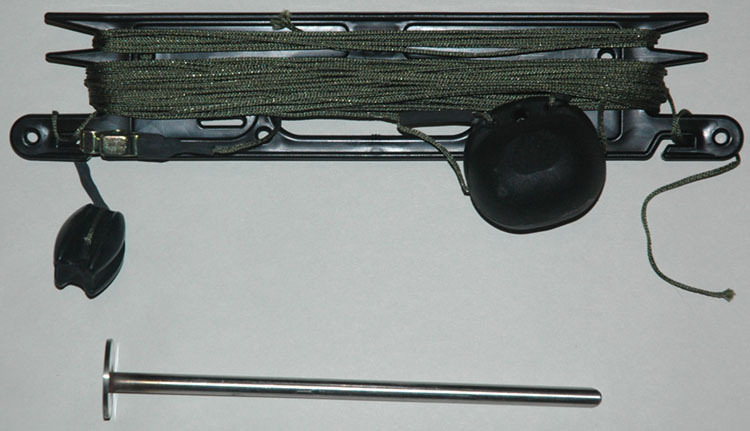 Included is camouflage aerial wire, wire holder, end insulator, earth clip, in-span sealed match resistor and earth stake. Tactical, Broad-band Antenna is a portable, HF broad-band antenna designed specifically for mobile and portable HF communication where rapid deployment and simplicity of operation is essential. It can also be installed as a semi-permanent base station antenna. The antenna will operate at all frequencies in the 2-30 MHz band without any adjustment or tuning required. It is ideal for use in conjunction with modern, digitally configured, HF communication transceivers where features such as ALE and frequency hopping require true broadband capability. N, UHF or BNC plug. Figure 1 Typical example of the antenna deployment. The antenna consists of fibre wire, possible Kevlar with conducting strands which makes the antenna very light an ideal for the purpose. The physical construction is as shown in Figure 2. The feed point which is a relativity high impedance feed point that I have experimentally established as being workable with a 1:9unun however interestingly not all my 9:1unun produced the same results. Within the radiated element at 15.4m from the feed point is a load resistor of 1k ohms. 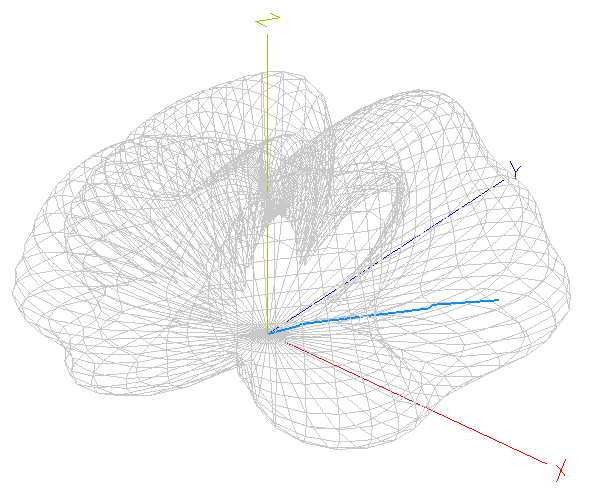 Figure 2 Typical antenna deployment including dimensions. All lengths are shown in metres. Figure 3 below shows measurements taken with the AIM 4170C antenna analyser of the HF Tactical Broadband Antenna using the 1:9 voltage unun for matching. The results do not produce the ideal VSWR of better than 2:1 across the band as indicated in the specifications and this likely due to not having the unique balun that was part of the original kit, however most of the amateur bands are below 2:1 and all with the exception of the 17m band are below 2.5:1. Figure 3 AIM 4170C antenna analyser of the HF Tactical Broadband Antenna using 1:9 voltage unun for matching. 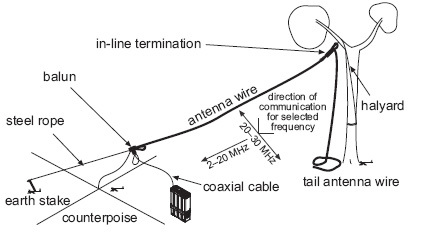 Antenna configuration included an earth stake as shown in Figure1 and Figure 2. Portable set-up appears to be a bit fickled and requires some configuration adjustments. The best matching results that very closely approximate the antenna specifications is with no earth stake and this includes all amateur bands from 160 through to 10m. The antenna appears noisier than the station antenna, however given the low test height of the Tactical antenna this would be reasonable to expect. Antenna is 2.5m above the ground at the high end and 0.5m at the low end. The antenna is above the ground with no earth stake. Balun used for is this configuration is a 1:9 Unun using a L15 ferrite core (1.8 - 30MHz). 1:9 voltage unun. On air test indicated that the Tactical antenna in the Test#1 set up is very inefficient on 80m when compared to the station dipole. 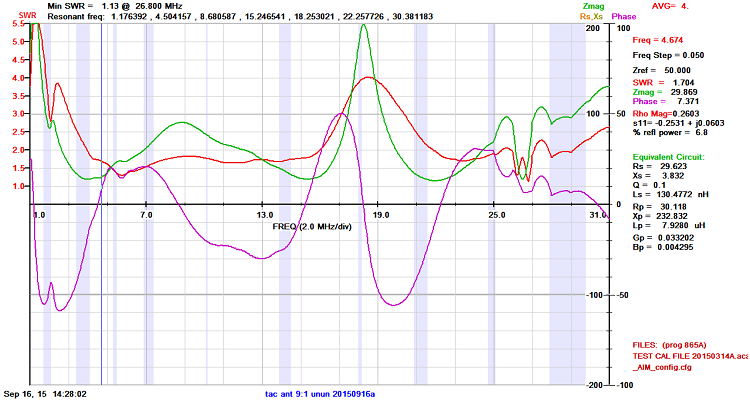 Local signals that would be expected to produce the best performance were up to 15dB worst than the station dipole. The band was noisy on the day with large static crashes, however a station approximately 100km was Q5 on the station dipole and only able to barely exchange call signs on the Tactical antenna.